Netflix released the official trailer for the final season of “House of Cards” on Monday. It teases an intense season that centres on Claire Underwood’s presidency after her husband, Frank Underwood, dies. It also suggests that things could go very wrong for the people who did very bad things to get ahead, including Claire. The sixth and final season of “House of Cards,” which was re-written after Kevin Spacey was fired following allegations of sexual misconduct last year, drops on November 2. 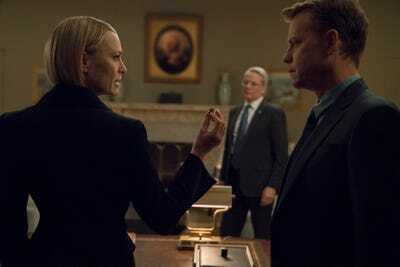 Netflix just released the official trailer for the sixth and final season of “House of Cards.” The trailer shows a country that is sceptical about its new female president, Claire Underwood (Robin Wright), and it also implies that things could go badly for her seeing as she, like her late husband, murdered people to get ahead. In September, a teaser trailer showed how “House of Cards” would handle Kevin Spacey’s departure: his character, Frank Underwood, is dead. The trailer also suggests that things might not be going well for Doug Stamper (Michael Kelly) now that Frank is gone, that the journalists who’ve been working for the entire series to bring the Underwoods down might be getting close to their goal, and that newcomers Diane Lane and Greg Kinnear might be Claire’s biggest enemies in season six. Netflix fired Spacey from “House of Cards” after multiple men accused him of sexual misconduct in 2017. The final season drops on Netflix November 2.